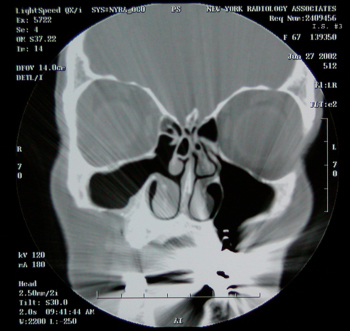 On the right side of the CT scan this patient’s narrow and complex sinus anatomy is seen. 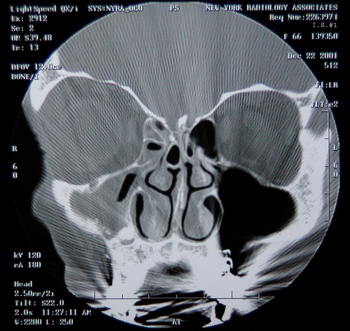 On the left side, surgery has been performed resulting in the widening of the sinus passages. Note: Black areas represent air. White areas are bone. Grey areas are soft tissue or fluid. 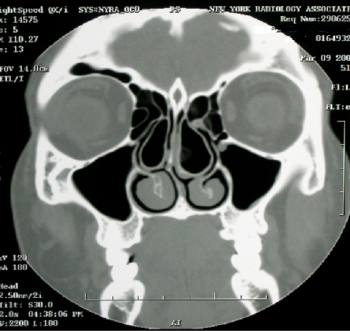 This patient had severe headaches and nasal congestion. 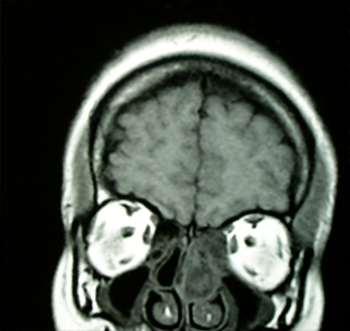 Note the cloudy swollen sinuses on the right side of this MRI scan. Note: Black areas represent air. Grey areas are soft tissue or fluid. This is the same patient as the previous scan, 2 months after being treated with antibiotics. The patient’s symptoms improved and the follow up CT scan returned to normal - even though she had a great deal of sinus passage narrowing. Note: Black areas represent air. White areas are bone. Grey areas are soft tissue or fluid. 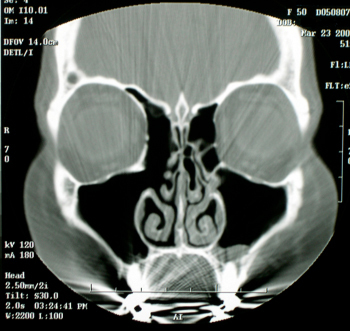 Before Sinus Surgery: This patient had an ongoing sinus infection as seen on the left side of this scan. Black areas represent air. White areas are bone. Grey areas are soft tissue or fluid. 6 months after Sinus Surgery. The fluid and swollen tissue seen in the previous scan has been replaced by normal air. The sinuses on the left now appear healthy. Note: Black areas represent air. White areas are bone. Grey areas are soft tissue or fluid.